As I already said, being a Good Community manager means being able to develop a community of Briends by creating relevant content to be shared and discussed on Social Media Channels. However, you need to select carefully how and on which social media channels you will publish your content and let your Briends discuss about it. When used for personal purposes, Social Media seem to be easy: anybody can create a Twitter Account, a Facebook Page, a LinkedIn Profile, and start sharing. Well, having that kind of strategy for business purposes will basically…. Not create any added value. Thus, the first thing you need to do is to build a strategy. So first, take a piece of paper and start writing your Social Media Roadmap: What? Where? When? How? Who? I’ll explain how to draw the perfect Social Media Roadmap in my next post. The first Social Media Tool you should create is a Blog. A Corporate Blog is the best way to display content that is relevant to your audience. It gives you an entire control on what you publish, and when you publish it. Plus, it’s a great way to improve your SEO, as you can share links to your main website in all your articles. You can afterwards create accounts for your company on different social media websites: Twitter, Facebook, LinkedIn, StumbleUpon, Digg, etc. Then, every time you will publish some new content on your blog, you will be able to instantaneously share it on all those channels, and therefore increase chances for it to be viewed and shared again. Now let’s say you have your blog and your social media accounts ready, and you start implementing your social media strategy. You will now have to measure its efficiency and start analyzing what works and what needs to be improved. Here are the 3 levels to evaluate the proficiency of your Social Media tactic. For this last factor, I suggest to use uberVU. uberVU has developed a very powerful solution that will analyze every online item where a specific keyword or group of keywords is mentioned, from press articles, to blogs, through tweets, links publicly shared on Facebook, StumblUpon, Digg, Reddit, checks-in on FourSquare, etc. For instance, let’s say you set up a search for “Starbucks Coffee”, UberVU will tell you how many times “Startbucks Coffee” has been mentioned on the web, and how many people saw the mentions. Exposure is good, but it’s better if it has an impact on consumers’ minds. It’s useless to tell a story if nobody listens to it. This is what we call the Level of Influence. For this second level of measurement, you will need to combine UberVU with another compelling tool: the Klout Score. Klout – which is also one of my favorite startups – has developed a complex algorithm that measures the influence of your Social Media Accounts. Originally based on Twitter only, the Klout score can now measure your influence on Facebook, LinkedIn, and Foursquare and will soon include YouTube. The Klout Score is the measurement of your overall online influence. It tells you how likely people who see content about your brand are to read and listen to it. The Network Influence measures the influence you have on influencers, i.e. people who have their own sphere of influence, and could potentially amplify your own influence. Klout will also analyze your content and specify on which topics you are the most influential about. For example, according to Klout, Starbucks Coffee is influential about coffee, food, and 8 other topics. UberVU has also a role to play in the measurement of your influence. It will give you the overall Sentiment Internet users have about your brand. It analyzes content to see if people talk positively, negatively, or neutrally about your brand. Combined with the Klout Analysis, this will provide you with a very interesting evaluation of your influence. You will know if people listen to you, on which topics, and if they react positively or negatively. Finally, the Bounce Rate will tells you if Internet users who found you through Google did actually stay on your page and read your content or just “bounced” and left to another page. You will find the bounce rate in your Google Analytics. Clicks are a the first criteria to measure the level of engagement, as it implies an action from the user. If visitors click on a link you suggested them to click on, it means that they don’t just listen to you, but also trust you and change their behavior according to you. You have to take into account the clicks on yout blog of course, but also on the links you share on your different social media accounts. To measure your level of engagement on Facebook specifically, you will need to count your comments, likes and shares. The new Facebook Insights tool lets you know that plus many other details about your fans’ engagement. The “People Talking About” metric is for instance a new feature that I appreciate particularly. 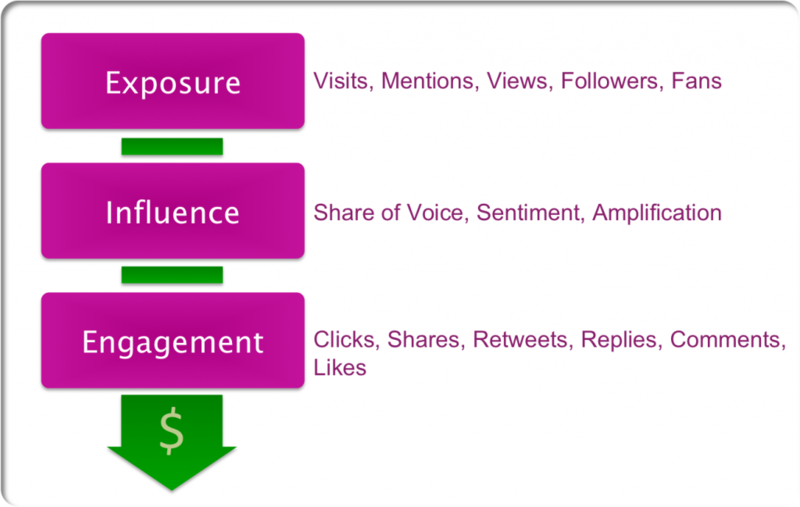 The Amplification Profitability in the third item measured by Klout. It gives you “the likelihood that your content will be acted upon” on Facebook, Twitter and LinkedIn: Likes, Comments, Retweets, @replies. And that’s it! Now that you have all those figures in front of you, it’s time for you to analyze them! And no, I can’t help you with this, as it would take me an entire book to describe the different scenarios possible! But don’t be afraid: it’s all about common sense. Exposure, Influence, and Engagement are the 3 steps you need to follow in order to improve your Customer Conversion and Retention, hence your revenues. However, Social Media Marketing will not be sufficient to increase your Reach, and will have to be coupled with traditional marketing solutions: Advertising, Viral Marketing, and Press Releases, mainly. Now you know almost all my secrets to determine and measure your social media strategy. Even if this list of tools is far from being exhaustive, it will give you an idea of the performance of your strategy, and how you can improve it. A piece of cake? Well, you can be the best strategist and analyst in the world, you will still need to bring this little piece of magic that will make your strategy actually work: passion and heart. Be passionate, love what you write and share, and your audience will pay attention, listen, and follow you wherever you go. Intéressant ton article, je le passerais à un de mes collègues, développeur et qui voudrait faire connaître des app qu’il développe pour Iphone. Moi aussi je vais certainement en tirer profit pour mon site sur Excel. En fait on a failli se connaitre à travers les CPL lorsque t’étais encore chez Microsoft ;), j’ai connu Nicolas Tann et Joel Chaudy. Je n’ai pas eu le plaisir de te rencontrer lors des Techdays mais je te souhaite beaucoup de succès aux US. Hello @[832373605:2048:Enzo]! Bien sûr, je me souviens très bien de toi, membre assidu des Communautés Partenaires en Ligne. Je te remercie pour ces compliments et te souhaite bonne continuation pour la suite également! Great article, I am always looking for tools and methods to increase my social skills. (Definitely my weakest point in online marketing). On the note of klout, I have read from some respected SEOs that through testing it would appear that their algorithm isn’t actually all that complex and may even be disappointingly simple. Not to say that is going to stop me from using it.